Honey is a big girl now! She seems to be getting close to full grown at around 50 pounds, she’s a great size for a golden! She will fill out some more and get her grown-up coat but her growth has slowed. 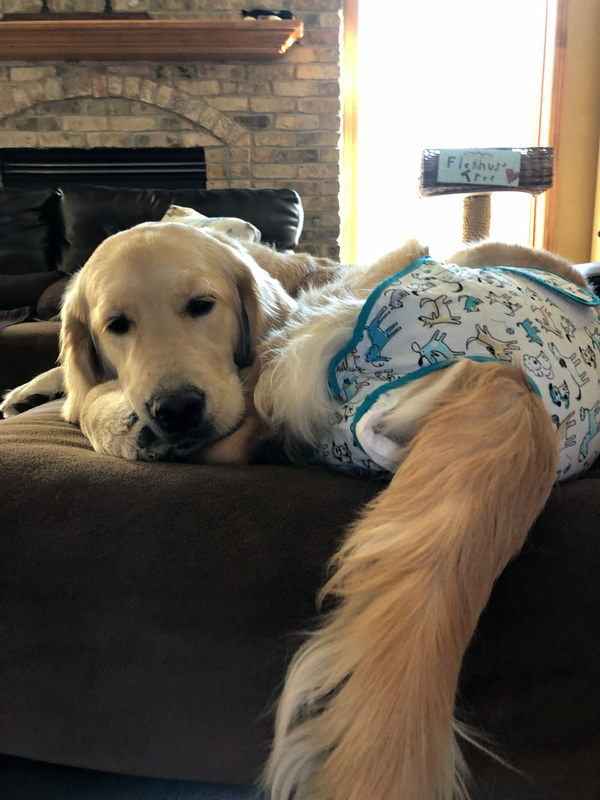 We continue to have some struggles with bladder infections and function, and even though she still has to wear her cute “pants”, she has seen some improvement very recently. Honey will graduate from Puppy Basics class next week! She isn’t the biggest fan of car rides so we’ve been trying to take her on short, fun trips instead of just yucky vet visits. And yet, when she gets to her vet appointments she’s an absolute super star! Everyone loves her wherever she goes, and her adorable diapers make her even cuter!! Honey has quite the engaging personality and even though she faces at least one more surgery, she continues to thrive in her foster home.